Aloe vera is a bona fide superfood with a laundry list of health promoting benefits. It’s not the most pleasant tasting substance on its own, but blend it into a smoothie with the right ingredients and you’re left with a tasty, nutrient-dense, super drink. Aloe vera has a long history of use dating all the way back to 1500 B.C. where the Egyptians recorded using it to treat burns, infections and parasites. Topical uses for aloe vera are more commonly known, but since we’re going to consume it in our smoothies let’s focus on the health benefits from internal use. Aloe vera gel is made up of water, 20 minerals, 12 vitamins, 18 amino acids, and 200 active plant compounds or phytonutrients. Quite impressive, as are the myriad health benefits attributed to aloe vera. The amount of gel you get from filleting fresh aloe leaves will vary. I typically shoot for about 1/2 cup. Feel free to use more or less depending on your preferences. Enjoy! Place all of the ingredients into your blender and blend on high until nice and smooth. Please leave a comment below if you try this smoothie recipe and find it as refreshing as I do. For more information on aloe vera and all its goodness, click here. It would be helpful if you said how much aloe vera (1/2 cup? ) instead of 1-2 leaves-i bought a leaf several feet long, and at least 8 inches thick-I can’t imagine 2-3 of these in anything. Can you also use aloe vera juice? Sure you can use aloe vera juice, Andrea. I would replace 1/2 cup of the coconut or almond milk with aloe juice. I actualy just brought have a cup of water to biol with a 2inch gel added 1 teasppon of honey and drink about 2 ounces every morning. Not had ibs since. How often would you consume this smoothie to reap the health benefits? One/two a week? Daily? Hi Ann, I would recommend 2-3 times a week to really benefit from the aloe, but daily is also fine and would likely expedite the health benefits. Cheers! I just tried out this recipe with my husband, and we LOVE it! I will be drinking this from now on! Do you have any other Smoothie Recipes for Aloe Vera? Would love to try them all! Thanks for sharing! Your comment brought a smile to my face. Great to hear you and your husband loved this smoothie. I have 3 other aloe recipes, and just made a note to add a couple more. what exactly do you mean by ‘filleting’? completely taking off the skin? when I made it I cut off the rough sides but not the rest of the peel. we noticed a scratchiness in the back of our throats, but otherwise it was fine and tasted great. I purchase my aloe leaves from my co-op or Whole Foods. Is it okay to eat the skin? I’ve done it both ways. Just curious if there’s any reason you shouldn’t eat the skin? Most people don’t like the taste of the skin, Nina. If you don’t mind it, feel free to include in your smoothies as it does provide additional nutrients. I watched the filleting video and, as an occasional fisherman, have a suggestion. I’m going to try using a filleting knife rather than a chefs’ knife, and remove the skin on the curved side of the leaf by cutting side to side, rather than end to end. I hope to reduce the small amount of waste to almost zero, for no real reason other than my need to do the job the best way I can. I like the way you think, Tom. Let me know how your filleting technique works. is it necessary to add honey, maple syrup and a sweetner? or is it either/or? and what flavor is basil, slightly minty? Optionally add either honey, maple syrup, stevia, or another sweetener, just one. Those are perfectly acceptable substitutions :) Glad you liked it. Aloe can be quite bitter. I tried to hide that with the blueberries, mango, and basil. The bitterness in certain foods seems to hit everyone differently. Maybe your aloe plant is slightly more bitter than average. Are you sure you filleted all the skin and only used the gel? Either way, using a smaller amount in future smoothies to allow your taste buds to adjust is a great idea. Hi Faye, You can rinse it – put the gel in a jug of water for 3- 5 minutes or so – that will take away the bitterness. I was at the Aloe plant factory in Aruba in January, 2015 and they informed us to rinse it if you do not want the bitterness which works as a laxative. I have tried rinsing it upon my return and it absolutely great in smoothie – no bitterness whatsoever. Thanks for leaving a comment. Great to hear you enjoyed this recipe – coconut oil and whey protein are nice add-ons. To avoid the bitterness of aloe you really need to make sure you fillet it properly. I would try 1/2 aloe juice and 1/2 coconut water. Coconut oil and water are quite different. The oil is more healthful and contains all the healthy fats, but both are great. I grow my own aloe vera, and have been putting it in smoothies for years. Here’s a few tricks I’ve learned for getting rid of the bitter taste. After I cut a stem/leaf off the plant, I stand it up in a glass and let the yellow sap drain…that’s the bitter part. Also, chill it before you put it in the smoothie. You can either just leave it in the fridge overnight and filet it before adding it to the smoothie, or you can filet it first and freeze the gel part (lay them out on a waxed paper lined cookie sheet. Sometimes I’ll harvest a whole bunch at once, drain them, filet out the gel centers and freeze them. Then, when I get ready to make a smoothie, I’ll just grab a few out of the freezer and pop them in the blender with the rest of the ingredients! Thanks for leaving such an insightful and helpful comment! I just updated this recipe to include that information. I’m sure I’m not the only one who will benefit. I bought an aloe leaf and on peeling it, it was red, unlike any others I have bought that were clear. Is this just a different variety, because the outside looks the same. Here’s the best explanation I could find on red/pink aloe, something I’d never heard of. Hi I’ve just tried the recipe and it’s amazing! I’m drinking juices from aloe vera for a year or so because it works great on my reflux, however the amount of the sugar in ready drinks is crazy. I’ve tried your recipe and it’s much better! No white sugar, and it’s made from fresh aloe gel. Even my husband loved it! Fantastic, Maria! Great to hear you and your husband like this recipe, but even better to hear you can consume this smoothie in place of a sugary aloe drink. I tried it. Didn’t have fresh basil or coconut oil. Used cubed aloe vera, frozen pineapples, mangos, coconut milk and flax seeds. Yum, yum, yum! Will use again. The outer skin of aloe is often bitter and tough, which is why it’s usually removed. However, it can be consumed if you don’t mind the taste and texture; so your dad is fine. Hi I’m drinking this smoothie for almost 2 weeks now. Instead of Chia I use Flaxseed, and lucky for me I started to lose weight. I live in the Caribbean, so I have my own plant of Aloe. Thank you for all the tips. Can I put one whole lime (juice only), spinach, kale and ginger with the Aloe smoothie? Sure you can add those additional ingredients to this smoothie – it will be that much healthier and nutrient dense. You can blend the whole lime (peeled). Will it make a difference if I use completely different ingredients except for the aloe vera? The nutritional content and taste will be different, by how much depends on which new ingredients you use. Give it a try and see how it turns out. I created my own unique smoothie much the same with the rest above and added spice ingredients: tea masala, a glove of garlic, turmeric, ginger and baby spinach. The end result is so delicious and very nutritional. I add protein powder depending on what time I intend to take. To sweeten, I use organic honey from sprouts store, and I love it. Wonderful, Alice! All of those spices and herbs are ones I’ve included in recipes on my site and encourage others to try and use. If you would be kind enough to divulge your exact recipe I’d love to post it on my site. Followed your directions. Drained it, peeled it, rinsed it then into the smoothie. No bitterness at all. Thank you! Growing my own aloe plants and never knew how to use it. Have been having a lot of stomach pain lately with nothing found in a bunch of tests done. So, even though that’s a good thing, I’m still left with the pain. Was also diagnosed with GERD, IBS. Trying to find something to offer me some relief (don’t wanna take meds) my hubby stumbled upon this recipe. We went out and bought all the ingredients last night and had it for breakfast this morning. I was pleasantly surprised. It tasted really good. Not bitter. Pretty good. We are going to make it a part of our morning regime to hopefully see some improvements in my tummy issues. Thanks for sharing the recipe. Nice to hear your enjoyed this recipe. I hope it helps your stomach issues. Have you looked into the GAPS diet? It’s a gut healing diet that I highly recommend. My husband and I have a smoothie every day for 3 years but I start this week adding aloe bout I use the green skin to not just the gel are thus ok ? 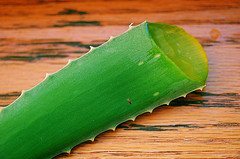 The green aloe skin is actually OK to consume, but most people don’t because of the taste and toughness. If you don’t mind it, go for it. Wow so I can have all the vitamins my body need in just a cup of smoothie. Thanks for sharing! I’ve been making my own version of Aloe Vera drink and thought I’d look around on line for some other combinations. I happened to land on your page and was delighted to find all your great information. I used your recipe as template. I would have never thought of adding fresh Basil…so wonderful! I added lemon juice to preserve it for a day, because I made enough for tomorrow. Hi Kathryn. Love to hear “I used your recipe as template”. That’s precisely what I encourage people do to. Basil is quite tasty. Lemon juice to preserve was a nice touch. Thanks for sharing your version of this recipe. Looks delicious and definitely nutritious. Now I want to buy an aloe plant! Looks yum and so healthy :) Thanks for sharing this kind of great stuff ..
You’re welcome, Cari. Enjoy the aloe! Thank you so much for this,I make smoothies every day and cant believe i never thought of my over grown aloe-vera plant, now you made this look so easy an I did it this morning , bet practice makes perfect. You’re welcome, Suzy. Nice to hear you’re incorporating aloe into your smoothies. Is the coconut oil essential? No, feel free to omit, Sarah. Smoothies with aloe vera are the best – thanks for sharing this recipe! Hi, Im from the Caribbean and Aloe Vera is a common household comodity. We use it raw on the face as its a natural source of minerals and vitamin e and excellent facial mask. Its used to cool burns and I swallow a cube of aloe ever so often, great cleanser. Its not very pleasant to the taste buds but im going to experiment with the aloe smoothies. Very good, Donna! I have a few aloe plants around my house, but forget to use it as often as I could. Thanks for the reminder. Hope you enjoy aloe smoothies, which tend to hide the taste. I added aloe vera to herbal life protien mix ,a banana some oats and flax seed meal and a little honey….it was awesome…I’m from Jamaica and i have severe GERD…just started gonna see if this helps…tired of the meds. Sounds delicious, Sandra! Good luck with overcoming GERD and getting of the meds. Been drinking daily and enjoy it. I don’t fillet the leaves I just cut a portion of the leaf in small pieces and toss them in with spinach mixed berries banana it’s good! Less prep the better for me. What brand aloe juice is the best? I am sure fresh aloe is better, but I wondered if I wanted to use it. I prefer Mountain Rose Herbs aloe vera gel if the real thing isn’t available. Do you mean how many consecutive days, Robert? I would think quite a few. Haven’t heard of anyone overdosing on aloe.